Six years ago Square Enix had a vision of a common platform from which to build a series of games under a single banner. That compilation became known as Fabula Nova Crystallis and was comprised of three titles at conception: Final Fantasy XIII, which has since been released, Final Fantasy Versus XIII and Final Fantasy Agito XIII. While the main XIII games were set to release on high definition platforms, Agito XIII began life as a mobile game. It was then announced in 2008 that the game would be moving over to the PlayStation Portable, as cell phone technology at the time was not efficient for what the team was aiming for. While what the game is now had only been in full development for about three years at launch, there’s no doubt that it’s been a long time coming. For better or worse, only Square Enix would devote the better half of a decade to a portable title after all. Following a name change at the beginning of last year and 2 UMDs later, Final Fantasy Type-0 finally took center stage for its release last October. As of today, the game currently stands firmly grounded in Japan – but is any potential western release worth waiting for? Type-0 begins on a somber note. Its dark opening sequence sets the tone for the entire game, which twists and evolves into a brutal war drama. In the world of Oriense, several nations once existed at peace, each guarding their own crystal of power. The Milites Empire, the Lorican Alliance, the Kingdom of Concordia, and Suzaku Fiefdom of Rubrum existed under a treaty known as the Pax Codex. That was until Cid Aulstune of Milites betrayed that treaty by militarizing the power of their Byakko Crystal. Cid swept through Oriense, decimating both Lorica and Concordia. Rubrum, however, was able to resist. By forcing an attack on Rubrum’s Magic Academy, Peristylium Suzaku, Cid attempts to force the nation into surrender. Thus begins the story of Class Zero, a small group of magic users tasked to recapture their crystal and defeat the Milites Empire and their mighty l’Cie. School-age mercenaries, the echoes of Final Fantasy VIII’s Garden are clear. Along the way they’ll meet main characters Machina Kunagiri and Rem Tokimiya – both transfer students whose mysteries will unravel a greater truth with eventual consequences. The trials of friends and enemies alike will be tested in this blood-soaked tale amongst twists and turns that rival even those found in FFVIII. Complex in some respects though Type-0’s story may be, it really drove home the essence of Final Fantasy much more than more recent entries such as Final Fantasy XIII and XIII-2, which felt like a tonal departure from the series of old, edging closer to traditional anime. With such a large cast of characters I was almost afraid that some of the plot would suffer, but fortunately that’s not the case. Rem and Machina, although originally outsiders, really come into their own as the “main characters” of the story, and the rest of the cast feels just as important. Simply put, the story is incredibly enjoyable. Certain dynamics between characters such as Machina, Ace and the rest of Class Zero are handled excellently and you really get a sense of specific character motivations because of it. Plot devices become absolutely engaging in their realism as they propel you to progress through the rest of the game. The character of Cid returns as a villain in this installment and for the first time in the series is the main antagonist. His motivations are fairly clear-cut – a desire to obtain the four crystals of Oriense for their power – or perhaps something else. You see, his true motivations are quite interesting, near to the point where you could almost sympathize with him in some ways… But at the core, Cid is still a very ruthless and believable dictator. Not even his own men dare betray him. Out of consideration for major spoilers, I won’t reveal too much in terms of the greater story. If I did, I feel the impact for those who haven’t played will be diminished. There’s so many great moments, you’ll have to experience each little detail for yourself. That being said, I think fans – especially those of classic JRPGs – will appreciate the emotional and certainly epic scale of the narrative. Final Fantasy as of late has been missing those meaningful epic moments. And while a lot of it can of course be subjective, the more recent entries have lacked their own water-cooler moments of the Midgar reveal, their own tale of a foulmouthed dragoon wishing to go into outer space. I think, especially in the case of FFXIII, there just hasn’t been that character attachment that existed in the earlier games, and I miss it. Type-0 at least calls back to some of the greatness found in the likes of Final Fantasy VII, and displays this feeling of power that exists in those earlier titles. I found myself wanting to care what happened to several characters, and the impact was all the greater when something actually did. While yes, certain mythological elements are present, I didn’t feel like they were in my face, large focuses of the story despite certain moments of deus ex machina – nor hampered by excessive jargon and side reading in a Datalog – though such a thing does exist in the game. The Datalog provides a lot of back-story for the world, much of which is fairly interesting. At the same time, enough information is presented in the main narrative as it should be. The use of Fabula Nova Crystallis elements such as l’Cie and fal’Cie are handled in much more interesting ways. For example, a l’Cie is seen as a positive, all-powerful being who possess eternal youth and fights for their respective country’s army. The drawback is that, within time, they’ll eventually lose their own identities despite being given a Focus by the crystals of Oriense. To put it simply, l’Cie in Type-0 are extraordinarily powerful – even more so than those found in FFXIII. Fal’Cie exist too, but the forefront of the story doesn’t rely too much on their role in the world. Type-0’s story is of course not without flaws. There’s a sense of plot points for the sake of convenience at times, similar to the effect of Guardian Forces in FFVIII. For example, in the world of Type-0 the crystals make people forget about others when they die, so they don’t understand the feelings of sadness or grieve like we do. While an interesting concept, I feel that this impacts a bit of the character development negatively in the end. The plot moves along too fast at times you’re left wondering why a specific character is doing whatever they are in any given situation. The devil is in the details, and on occasion here the details appear forgotten. With that said, it’s still an excellent tale. It would have been nice to see a little more interaction within the halls of the Magic Academy itself as well. While the main focus of Type-0 is of course its war story, a good portion of the game is spent wandering around Peristylium Suzaku. In some what Persona-style fashion, days go by depending on your actions, but there’s not much in terms of development aside from talking to your typical NPCs who spout lines that are sometimes interesting and sometimes useless. Another major complaint lies with the game’s ending – which pushes players towards a second play-through. Playing again will tell a different side of Class Zero’s story and the challenges they face in life. The game almost forces you to play through a second time in order grasp everything and understand specific character motivations – and that feels like a low blow, especially in a lengthy game on a portable machine. The game was designed with at least two stories in mind, which is a little unfair for those who only play once – they’ll potentially miss out on a much more fleshed out version of the narrative, similar to what was done in Nier. Aside from story, perhaps the biggest call back to earlier Final Fantasy titles is in Type-0’s gameplay design. The laundry list of familiar staples is all here: airships, world maps, towns, summons – you name it. The layout of the game is entirely mission based – which makes sense given that the game is meant to be a portable experience. In that respect it vaguely resembles Crisis Core. Small bits here and there make it a great game to play either in small chunks or long lengths of time. Type-0 presents a sizable world from the start. Those who enjoyed Final Fantasy VIII will be right at home in the world of Oriense right down to the militarized school setting, ability to ride and raise chocobos and even fighting random encounters across the world map. It feels like a love letter to the older fans who miss these elements in newer games. The world map itself is known as the “Active World Map.” Similar to past FF games your character is able to traverse over a scaled down environment – but whilst most world maps are typically free roam, the one in Type-0 lacks in exploration somewhat. There’s certain areas you can’t enter without having progressed through the game to a certain point, and portions of it are connected by load screens or smaller dungeons in the form of caves. The airship also doesn’t become available for use until the final chapter, which is somewhat of a let down. Towns do exist in the game, but perhaps due to hardware limitations, they’re nothing too exciting – typically a small village where you can buy items and do mini quests and nothing more. As well as the nostalgia, Type-0 presents new gameplay elements that make the world come alive in different ways. Skirmishes are the RTS-like mini-game which lets you move around groups of troops in order to capture different town areas. Each mission contains specific objectives which once completed net you control over specific areas. During these battles you’ll have the ability to take your characters into certain village areas and complete different tasks at hand. Some of the RTS battles are optional, but a few of them are required to advance the story and can be quite frustrating. Failing to protect your own bases will result in game over, much like in any strategy game. Airships have always been a staple of FF, but Type-0 ups their role with airship combat. Once something that was originally intended for Final Fantasy XII, this unique combat experience finds itself as one of Type-0’s standout features. Although you’re not exactly fighting other airships, your party leader can take control of canons as you battle mounted dragons from the kingdom of Concordia. While fairly simple, the dog fights provide a nice break from normal combat since the segment is fairly easy to get through. Type-0 has a somewhat unique battle system. Building upon the refined ATB Kai system found in Crisis Core: Final Fantasy VII, the game uses a highly action-oriented party combat set up. The main difference here is that all commands are mapped to specific button inputs rather than sifting through menus. Each character has a different weapon and combat style – some harder to use than others. For example, characters such as Ace, King and Queen are easier to move around while characters like Jack or Ace who are slower but can deal far more damage when necessary. The game encourages you to really dig into those action game strategies at times while punishing novice players. Battles consist of attacks ranging from melee to magic depending on a character’s abilities, which can be activated at any save point. In Type-0 you can execute a brand new ability known as Kill Sight, which instantly kills an enemy character. This feature especially comes in handy during tedious boss encounters. Battles themselves are fast and fun, although like any real-time action-based game can become repetitive after a while. Although improved from the original demo for the most part, the camera still finds a way to get hung up at times. Given that Type-0 is largely an action game, this is troublesome especially in smaller interior levels and corridors. Magic itself is divided into several different types which can be upgraded through different add-ons. The basic elements include fire, ice and thunder, as you’d expect, but these can be paired with a different style of attack including Shotgun, Rifle, Bomb, Missile and Rocket Launcher. The energy that powers these upgrades is known as Phantoma. Phantoma is similar to the traditional MP – but is acquired through defeating enemies. Once you down an enemy you have a limited time to take their Phantoma as your own. By stealing Phantoma you’ll recover some of your own MP while on the battlefield. Once enough Phantoma is gathered, you can spend it in Type-0’s very own version of FFXIII’s Crystarium system. Known as the Alto Crystarium, the way upgrades work are a little different than what was present in FFXIII and XIII-2. The Alto Crystrium is mainly meant to power up magic – in XIII it controlled the majority of your character’s stat upgrades. You can increase your Fire RF magic’s strength, MP usage, call time, reach and speed, for instance. Each upgrade requires a specific amount and color of Phantoma to initiate. At save points and at certain points in missions you’ll have the ability to choose a party leader as well as two other support characters with the rest as interchangeable back-up. During this time you’ll also be able to upgrade various parts of your characters, including the traditional purchasable equipment upgrades. Should one of your characters fall in battle, simply tab over and select a new one to take their place. If you use up every last one of them you’ll get a game over, so be careful. Leveling itself can be tricky – characters level slowly, especially since you have 14 characters at your command and generally won’t use all of them on missions. I found myself selecting several of the same characters each time, meaning they became the best while everyone else remained too weak to take into later segments without some serious grinding. Before the start of a mission a single summon can be equipped for later use in battle as well. Summons return in a more classic form – comprised of a set of the more recognizable ones including Ifrit, Shiva, Diablos and Bahamut. Known in the game as “War Gods,” these summoned beasts were created by Suzaku using the power of their crystal and are used to shield against weapon technology. The current leader in your party will sacrifice themself upon calling them, and therefore become unusable for the rest of the mission. The benefit to this is that you’ll have complete control over the summon in battle – allowing you to overcome even the toughest of foes. Realistically you can play the game without even using them, but having a summon in some of the game’s more difficult sections goes a long way, especially in the latter half of the game. Type-0 also allows a secondary battle support option. Again, this can be chosen ahead of time, but doing so will allow you to summon in random NPCs for a time period of three minutes. Interestingly enough, this system also ties into the game’s multiplayer functions. In place of NPCs, three live players can be called forth when your party is nearing termination – again for a timeframe of three minutes. Time can be increased if you obtain enough SP. Of course, the multiplayer is entirely optional and not necessary to complete the game. Opting to at least go with the NPCs, however, is definitely recommended despite sketchy AI. The world of Final Fantasy Type-0 is one of detail and familiarity. Many of the locations and worldview seem upheaved right out of Final Fantasy VII or Final Fantasy VIII, fan favorites. This comes as no surprise given that Yusuke Naora, art director of those titles, has returned in full force. No two locations in Oriense are really the same. From the fields of Suzaku to the totalitarian style Milites Empire – the attention to detail and variety paint a picture-perfect image of realism over a backdrop of a war-torn world. Although not the first Final Fantasy to feature blood, Type-0 probably has the most out of any entry. The amount of violence was enough to label the game with a C (age 15) rating – Final Fantasy games typically sport CERO B, which is 12+. It’s definitely warranted, to say the least, given the mature themes and visible death and destruction throughout the story. This is really one of the best looking PSP games ever created thanks to arriving so late in its life and some brilliant artistic direction, with cutscene details taking a page out of the HD generation’s design philosophies. Square Enix has decided to cut down on the amount of CGI content and instead pre-rendered a good portion of the event scenes using touched up in-game assets. It definitely goes a long way to insure a smoother transition from gameplay to cutscene, but also helps to bump the game to two UMDs, too large to fit on one. Character designs are more contemporary, courtesy of series staple Tetsuya Nomura. Keeping with the tone of the world, Nomura’s work in Type-0 is rather tame for him – the hair colors and styles are restrained, but still different enough that each character remains original and easily recognizable. Considering this is a portable title, the amount of ambition is astounding on almost level. Type-0 boasts one of the largest voice casts in the series – perhaps another reason why a localization remains unannounced. Square Enix has gone out of their way to ensure each one has a proper actor – including the likes of Takahiro Sakurai (Cloud Strife), Yuuki Kaji (Hope) and Keiji Fujiwara (Reno). Despite the reliance on familiar voices – to Japanese and importers, at least – each actor does well in their own portrayal of these original characters. Such a large cast definitely helps the game come alive. The crowning jewel atop Type-0’s many achievements comes in the form of the game’s original soundtrack. Composed by Crisis Core and Dissidia maestro Takeharu Ishimoto, Type-0’s score stands up as one of the best in the series. Strong vocal themes coupled with arrangements of traditional Final Fantasy songs such as the Prelude and moogle themes do well to stand out on their own – which is refreshing when you consider some of Ishimoto’s previous work. There’s a sense of connectivity with certain themes, which weave themselves throughout the entire score. If there were one word to describe the soundtrack, it would probably be “Epic” much like the game itself. Although Final Fantasy Type-0 still has yet to be officially announced for western territories, director Hajime Tabata has mentioned that the team is currently working on an overseas version. Whether or not that means we’ll see a conversion to PS Vita or even a PSP Remaster for PS3 remains to be seen. In the meantime, all western fans can do is hope that this gem won’t be lost in the localization shuffle. Western woes aside, Type-0 is by all counts even more grand and ambitious than its vanilla FFXIII cousin – it’s absolutely massive! Type-0 is proof that you don’t have to rely on cinematic, linear experiences to create a great game – relying on what’s proven in years past has once again triumphed in an age of 4-5 hour FPS campaigns. With hours of enjoyment at hand despite small hiccups in the narrative, certain gameplay elements, and heightened difficulty, it would be an absolute shame if it never left its homeland. Despite its minor disappointments, Final Fantasy Type-0 is a more than worthy entry into the FF mythos and in my eyes a step in the right direction for the series as a whole. Although the game exists on a handheld, Type-0 provides a home console-level experience and shouldn’t be ignored by fans as a result. Given FF’s recent troubles with XIV and split fanbase opinion over XIII and its sequel, Square Enix would be wise to give it its due attention before it’s too late. 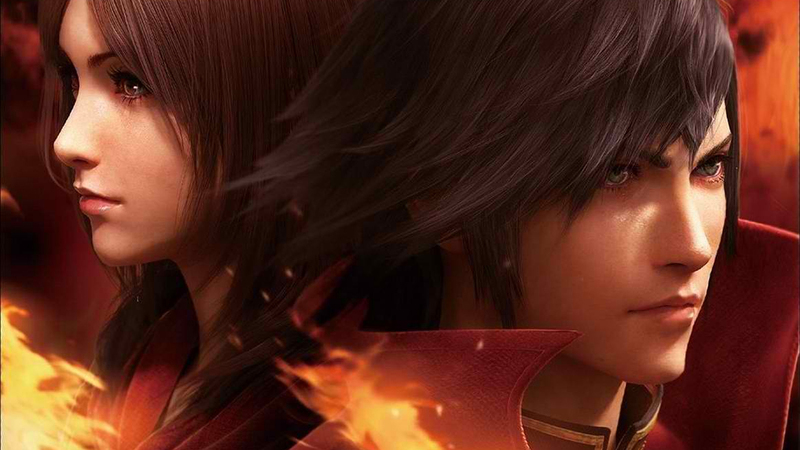 Final Fantasy Type-0 is region free, and can be easily and readily imported. Disclaimer: This review was based off final retail code of the Japanese PlayStation Portable version of Final Fantasy Type-0. Read more about the Nova Crystallis review policy here. Posted in Final Fantasy Type-0, Reviews, Special.